Today's world requires as never before that we all accept change and be part of it proactively. Mounting evidence shows there is no time to wait for people to decide to catch on in their own time. No better example of this exists than the plastic plague. Until we stop participating in trashing the planet and ourselves we are slashing away at our planetary wrists in ecocide. Is it so hard to make sure a vendor does not provide a plastic straw in our drink, and is it so hard to avoid buying a new handy gadget? The right choices are easy much of the time, but nearly impossible sometimes. This demonstrates the strangle-hold industrial culture has on our lives, as long as the economy continues to provide goods and set the tone for lifestyle. Since the Northern Pacific Garbage Patch -- a plastic soup twice the size of Texas -- was discovered in 1997, and from subsequent research, it was thought that plastic did not degrade except for breaking down into smaller pieces. It was known that plastic leached poisonous petrochemicals and heavy metals into the environment and into animals and humans. Now the story unfolds some more, most alarmingly, as the article below shows. Plastics in the ocean and on land seemed static enough, although they were known to be in part ingested and passed up the food chain -- bioaccumulating. But sea water with bisphenol-A as a constituent? This new discovery ought to ratchet up the agenda to fight the plastic disaster. The old model of educating consumers bit by bit year after year, and passing compromise-based legislation, has failed -- time is now too short. Clearly it is time to shut down the plastics industries because the mess only grows. The petroleum industry will continue to spew plastics and greenhouse-gas emissions, among other pollutants, as long as people buy these products and believe that such corporations have a right to do this. Belief in our present form of government as protector of the people and of the environment is mislaid. Trying to live sustainably and being the change we want to see is laudable but only goes so far in the present circumstances. Therefore, collapse of the industrial system will have to take place before significant changes, such as the termination of more plastics into the environment, can happen. This was a shocking, radical statement at the time. As the picture gets worse as it comes into focus, it is time to boycott petroleum and starve the corporate state of any material or moral support. How much worse can it be if we have to reinvent human relations with a sane value system, where caring for the Earth is not secondary to economic growth? Scientists have identified a new source of chemical pollution released by the huge amounts of plastic rubbish found floating in the oceans of the world. A study has found that as plastics break down in the sea they release potentially toxic substances not found in nature and which could affect the growth and development of marine organisms. Until now it was thought that plastic rubbish is relatively stable chemically and, apart from being unsightly, its principle threat to living creatures came from its ability to choke or strangle any animals that either got caught in it or ingested it thinking it was food. But the latest research suggests that plastic is also a source of dissolved substances that can easily become widely dispersed in the marine environment. Many of these chemicals are believed to toxic to humans and animals, the scientists said. The scale of plastic pollution in the sea has only been widely recognised in recent years when sailing yachts reported vast areas of ocean, such as an area estimated to be twice the size of Texas in the North Pacific, that seem to be permanently covered in a layer of floating marine litter caught up in swirling ocean currents or gyres. Some of the items were found to be many decades old, suggesting that the plastic took a long time to degrade. However, a study by Katsuhiko Saido at Nihon University in Chiba, Japan, has found that plastics degrade relatively quickly in the conditions and temperatures that were designed to simulate the environment of the open ocean. “Plastics in daily use are generally assumed to be quite stable. We found that plastic in the ocean actually decomposes as it is exposed to the rain and sun and other environmental conditions, giving rise to yet another source of global contamination that will continue into the future,” Dr Saido said. “To date, no studies have been conducted on plastic decomposition at low temperature in the environment owing to the mistaken conception that plastic does not decompose. The present study was conducted to clarify that drift plastic does indeed decompose to give rise to hazardous chemicals in the ocean,” he said. Findings from the study were released yesterday at the American Chemical Society meeting in Washington. Dr Saido said that samples of seawater collected from the Pacific Ocean were found to be contaminated with up to 150 parts per million of some of these components of plastic decomposition. “This study clearly shows new micro-pollution by compounds generated by plastic decomposition to be taking place out of sight in the ocean. Thus, marine debris plastics in the ocean will certainly give rise to new sources of global contamination that will persist long into the future,” he said. It is estimated that there could be hundreds of millions of tons of plastic rubbish floating in the world’s oceans. 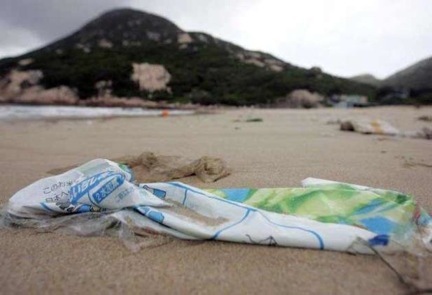 In Japan alone, it is calculated that 150,000 tons of plastic is washed up on its shores each year. Plastics Plague articles in Culture Change including this summer's voyages of Capt. Charles Moore on the Oceanographic Research Vessel Alguita.